Howdy, dear friends! 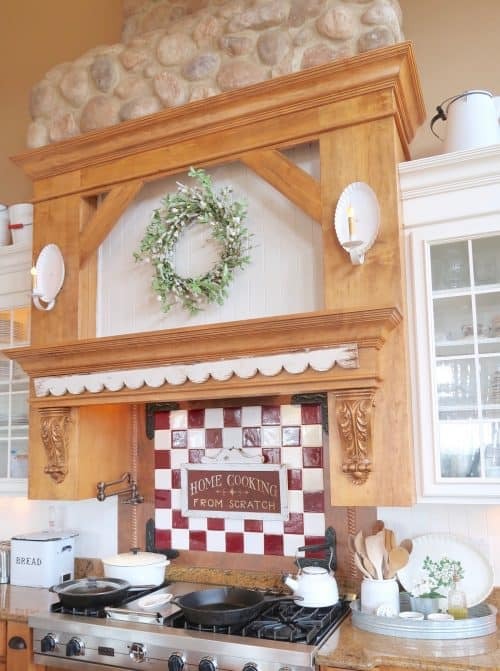 Today I’m bringing you a practical and cute idea for your kitchen! I put together this tray of a few of my stove-side cooking essentials. 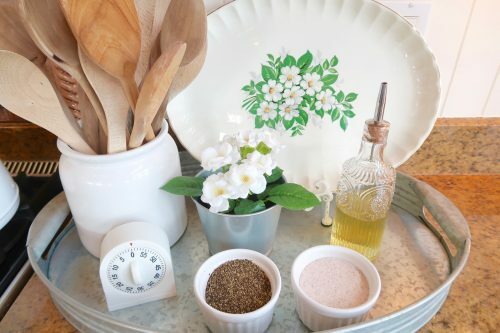 A crock of my favorite wooden spoons, my old-fashioned kitchen timer, pepper and salt in little ramekins, cooking oil in a pretty container, a pot of faux flowers and a vintage platter decorated with a delightful spray of apple blossoms. I love having these things easily accessible while I’m preparing a meal for my family and I love it even more if it looks cute! I’m intentional about creating little areas of loveliness in the nooks and crannies of my home. It just seems to add some cheer to my daily routines. You see, our environment affects our mood and emotions. When we surround ourselves with beauty in a fresh, clean home it brings comfort and joy. It’s what makes home feel homey! 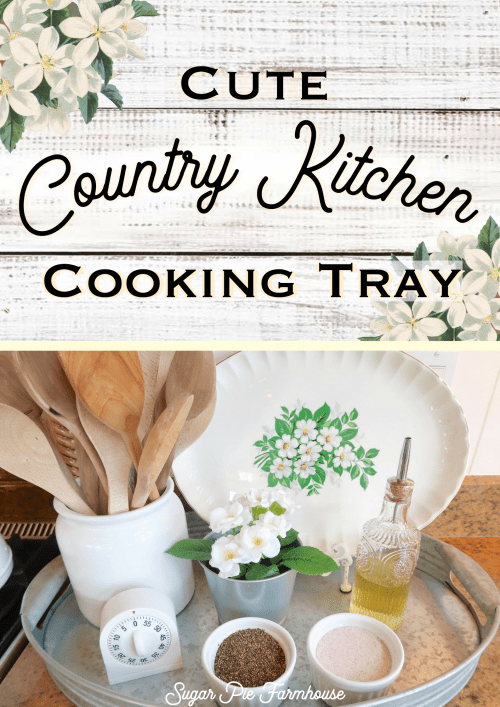 This idea of a stove-side cooking tray is so simple yet so delightful because it’s pretty and practical! All you need to do is just gather a few things you use to cook with every day and put them on a tray with something pretty! I found my tray at Walmart for around $10. My pretty oil container is from the Pioneer Woman Collection at Walmart too. The sweet apple blossom platter cost me $5 at my local flea market. I already had my kitchen timer and the white ramekins/custard cups to put my salt and pepper in (you certainly can use salt and pepper shakers too!). 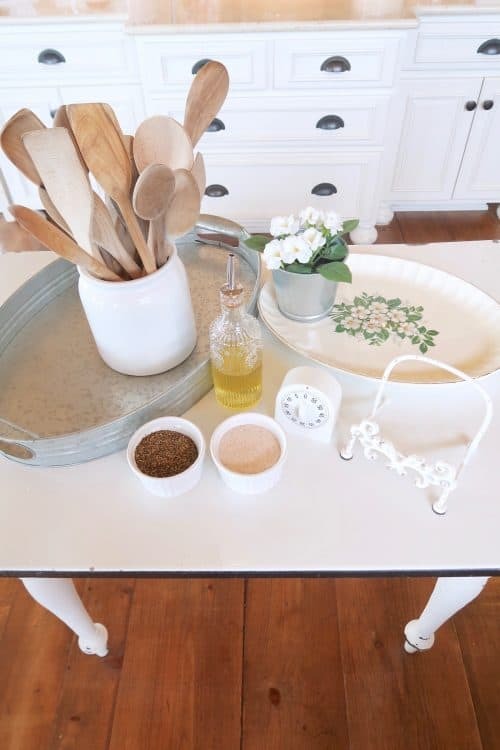 By putting your wooden spoons in a crock or large jar makes them easy to grab instead of having to rummage through the drawer looking for your favorite one. The little stand for the platter came from Michaels. It’s so easy to put together! 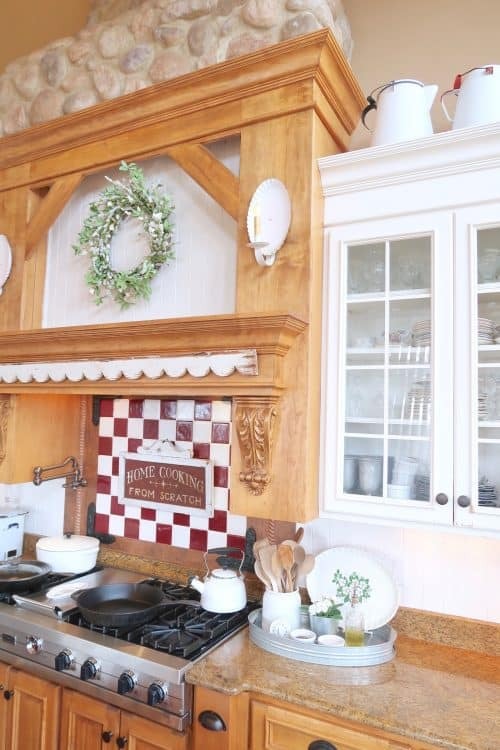 It sure adds a little sunshine to your cooking corner! “Why do we love certain houses, and why do they love us? I hope you enjoyed this simple yet practical idea to bring convenience and beauty into your kitchen! I just want to THANK YOU for the shortcut Amish Friendship Bread recipe. It is wonderful and no more feeding batter. I have made it several times and yesterday I even forgot to add my vanilla and it’s still wonderful. Thank You Be Blessed and remember JESUS Yashua is Lord. 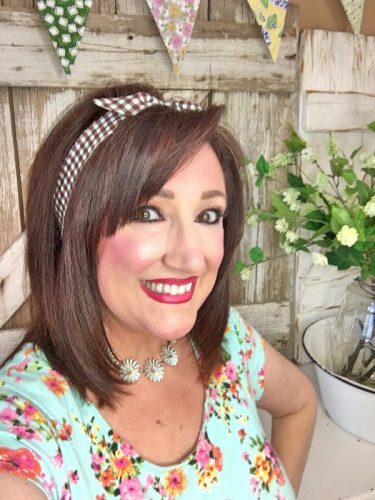 I don’t do social media so I can’t help you with reviews. Yeshua is everything – AMEN!!!!! I’m so glad you love the bread and honored that it’s become a repeat recipe! Thank YOU!! !